I remember, many years ago, visiting the Banana Caberet in Balham, South West London which was the local pub’s (The Bedford) version of comedy night. 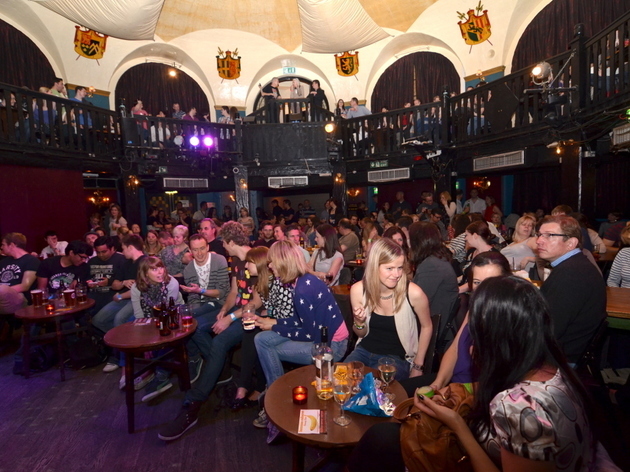 In fact, for our £12 entry fee we were treated to some great comedy nights, a minimum of 3 aspiring comedians and after that, a good old boogie. A bottle of pino was £6ish, so an unmemorable night was guaranteed. I recall watching an up and coming Lee Mack of ‘Not Going Out’ fame. Me and one of my besties were in the audience, and due to arriving late were sat quite close to the front, which turned out to be an unfortunate seating position as each toilet visit during the acts were remarked upon by the comedian of the moment. I have to say that the acts went on for about 2 hours so a toilet trip was not unusual by any means and getting noticed that way was not ideal unless you liked to be ridiculed for your weak bladder. Mr Mack, as part of one of his sketches was referring to the shape of people’s faces, and due to the second or third bottle of £6 Pino being downed, I haven’t the foggiest what his sketch was about. Anyway, there were only 2 shapes of faces, according to Mr Mack – either a horse or a plate. Sadly, my friend, pigtails in tow, so you might say she was asking for it, got referred to as a horse (I think she’s never forgotten), I was called a plate. I felt smug, at the time? Not sure either is a compliment though, in hindsight. Anyway, the reason I mention this, is that one of the comedians, and I think it was Mr Mack in my Pino haze, but can’t be sure, had a sketch about our ecological footprint and our feeble attempts of worldwide recycling. He basically said that the UK’s acts of recycling were so insignificant, it was akin to using a dustpan and brush to tidy up the moon’s surface. 12 years on and I still remember this jibe at our recycling efforts (who’d have thought that cheap Pino doesn’t automatically result in total memory loss). Since moving to the country, I try more than ever to reduce my impact on the environment (which is totally laughable since I now have to drive everywhere as public transport is non existent). My recycling bin is twice the size of my normal bin and I also compost all my food and the garden waste. 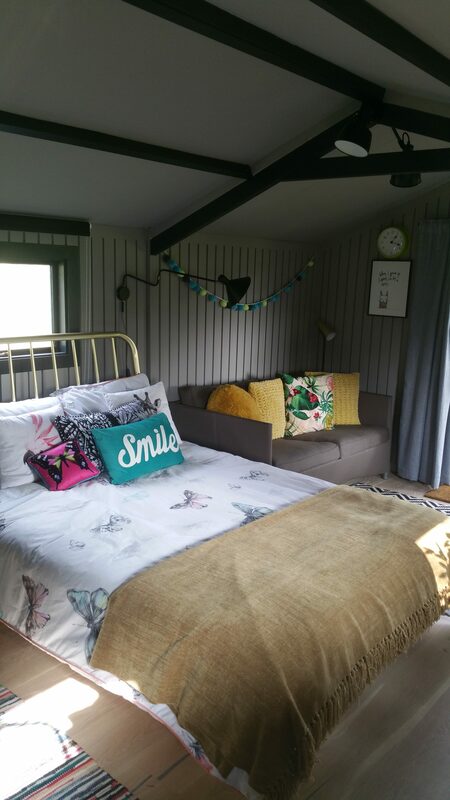 I recently completed my renovation of the Summerhouse at the bottom of our garden and initially advertised it on Airbnb (nuff said), I am now turning it in to my studio, which was my original intention. One to the challenges I faced on this project was the installation of the bathroom and small kitchen as I didn’t have access to main sewage in my garden. We are on a septic tank and I’ve no idea where all the pipe work is, so when we planned the summerhouse, we also planned a green bathroom and kitchen. Firstly, we installed an eco toilet. The joy of a the eco toilet we installed is that everyone, man, woman and child has to sit down to perform their bodily functions. The No 1’s and 2’s remain separate. The No 2’s go into a big tub which is ultimately compostable and the No 1’s escape to a soakaway. The downside of the eco toilet is that it’s quite big and bulky. Not the prettiest toilet around. So I had to design the small bathroom to make it look visually stunning. 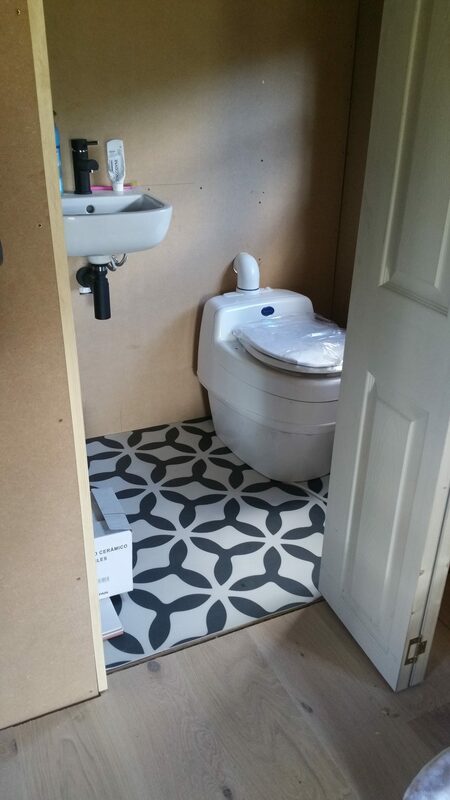 The floor is down, the toilet placed into position. It now needs to be fixed to the floor. Its big and bulky isn’t it? 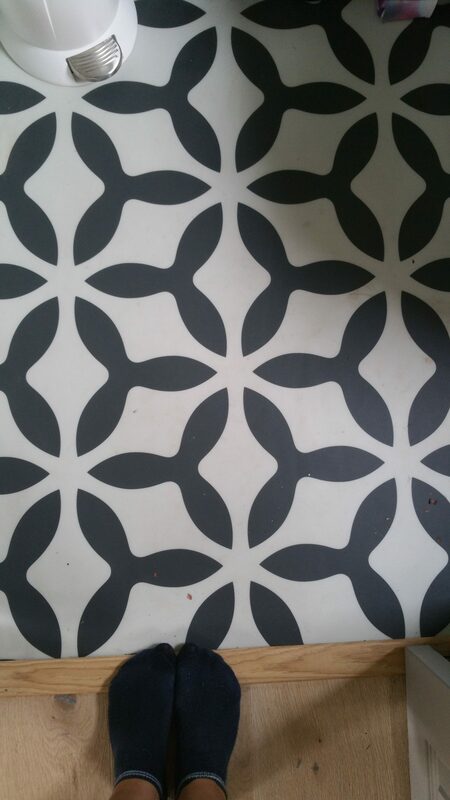 When looking through the pages of Living Etc a couple of months back, I came across a beauty of a vinyl floor by atrafloor. The design is called concave. 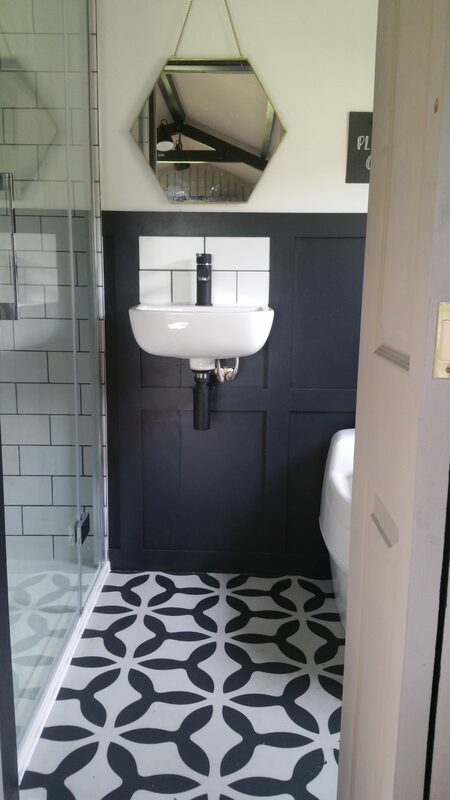 I knew that this was the flooring that would make the bathroom, small and perfectly formed, look the bees knees. Also, since the summerhouse, is a converted shed, it’s on a wooden frame and likely to move, a bit. So tiling the floor wouldn’t be a great option. Vinyl is the way to go. When I spoke to the sales department, I was really impressed and taken aback that every order of flooring is a custom print, made to order, nothing is held in stock and everything can be bespoke. I ordered the smallest amount possible as the space for it is 1m x 1.8m and it arrived in a couple of weeks, just in time for when the walls of my bathroom were finished. My builder was given the roll of flooring. His comments, which I solicited as I knew I would include it in a blog post, was that the flooring was thick, of high quality but also very easy to cut and manipulate. I think it took him less than an hour to install. The bathroom measures 1m x 2.6m. I wanted to get a decent sized shower in there. For me there’s nothing worse than having a shower in limited space, bending down to get your shampoo and feeling the chilliness of the tiles on your rear end. No thanks. The shower cubicle is a comfortable 1m x 0.8m. Where I came undone though was with the shower screen. Initially, to save money I was going to put a shower curtain in, even though I’m not a fan of them. But after installing the shower tray I realised I’d gone for a low profile tray and there was no where for the curtain to sit on, which meant that water would flow all over when the shower was on. No problem I thought, the shower area was 1m wide and it would be easy to put a fixed screen in here. There was lots of choice of shower screens which were 1m wide. Now – this is where I learnt an important lesson when buying shower screens. Be warned. The measurement given for a shower screen, in the main is the measurement you take before applying any wall treatment e.g tiles. The actual shower screen, if it’s advertised at 1m wide is about 5cm narrower. When the screen was installed – it didn’t fit. Believe me I complained to the sales company but was rebuffed and told that it was common plumbing knowledge that the screen’s weren’t the width advertised and that you had to make an allowance for tiles. Since you don’t need to be a plumber to install a shower screen, this means that I won’t be the only one who’s fallen into this trap. The basin, was an inexpensive one, purchased for about £59 but totally works in this space. The tap, was from Amazon. Another bargain. And the mirror from Marks and Spencer. Please let me know what you think of the bathroom. 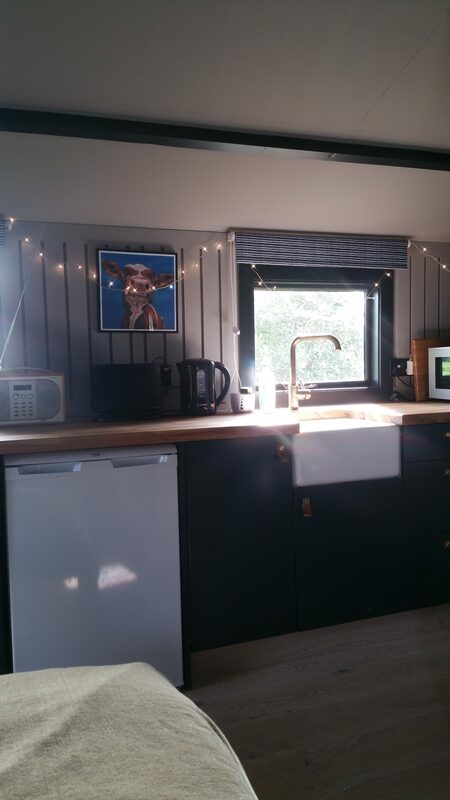 I’m thinking of wallpapering the wall above the panelling to make it more distinctive – what do you think? If you want to check out the vast array of vinyl flooring on offer, please click on this link. 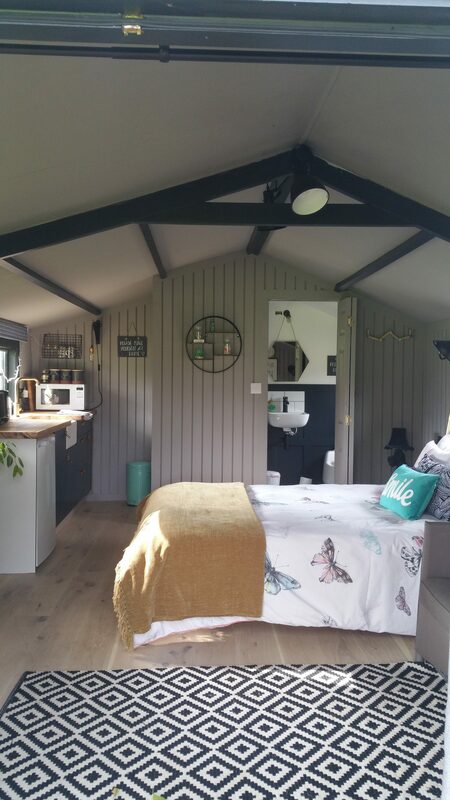 And if you want to see more updates on how I converted my 3m square shed into a luxury summerhouse, the vast array of lighting used, and the many other products that I’ve used in this conversion, then please subscribe. Thank you so much for reading. 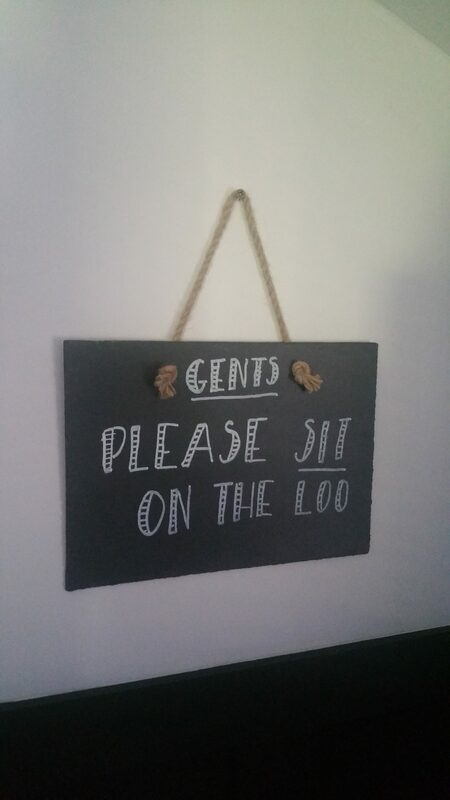 And I’ll leave you with a few images from the Summerhouse.